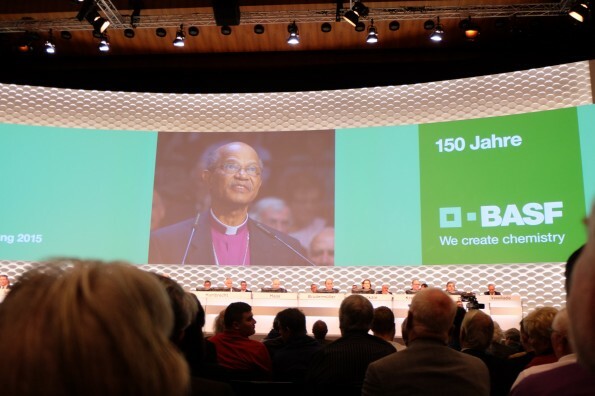 German campaigners facilitated Bishop Jo Seoka, the Chair of South African NGO Bench Marks Foundation, to speak at the BASF annual general meeting on their links to Lonmin, and 2012’s tragic Marikana massacre. Mannheim, Germany/Pretoria, South Africa – The address of South African Bishop Jo Seoka at the BASF Shareholder’s meeting in Mannheim, Germany, was well received by the shareholders. In the address he demanded reparation payments for the families of the killed miners from 16th August 2012 in Marikana. Some shareholders were surprised at the news that BASF is the main customer of Lonmin, and supported the demands of the Bishop. In his reply, the CEO of BASF, Kurt Bock, said, that “the BASF board is also disturbed at what happened in South Africa, but it’s hard for them to judge from this distance. Therefore they cannot pay anything for the demanded fund of 3,4 million Euro towards the families of the deceased. One of the shareholders disagreed with this notion and challenged BASF to work on its public relations to improve its image. Another shareholder found it ironic that the CEO claims that the company is globally linked, yet on the same breath says that they could not do anything because of the ‘distance’. This does not make any sense in a world of technology which makes communication simple and fast, especially for the world’s biggest chemical company. Bishop Seoka, chairperson of the Bench Marks Foundation, extended an invitation to BASF and its shareholders to visit and experience first hand Lonmin’s operations. The compny can then engage Lonmin factually and constructively on the way forward. BASF faced questions about its sourcing of platinum from a South African mine where strikers were shot dead by police, highlighting the challenge of controlling suppliers while promoting humanitarian credentials. Chief executive Kurt Bock rejected calls at the company’s annual shareholders’ meeting last week to pay into a fund to support the families of Lonmin miners who were killed during a strike at the Marikana mine in August 2012. He answered questions posed by Johannes Seoka, a South African Anglican bishop, read out in German by Markus Dufner of the Association of Ethical Shareholders Germany. The world’s biggest chemical company should “take responsibility as Lonmin’s principal customer” and make reparation payments to the families of the miners, Seoka said through Dufner. Ludwigshafen, Germany-based BASF should also look into the housing and working conditions around Lonmin’s mines, where many workers live without running water or electricity. Lonmin, the world’s third-biggest platinum producer by volume, saw strikes over pay in 2012 that culminated in the killing of 34 protesters by police in a single day. Seoka said that Lonmin beared some of the responsibility for the deaths. The issue stresses the difficulties companies have with controlling how they source components for their products. IPhone maker Apple hired a watchdog to inspect working conditions at factories after suicides at its Chinese partner Foxconn Technology in 2010. Bock is a board member of the UN Global Compact, an initiative for businesses committed to aligning their operations in areas of human rights, labour and environment. What happened at Marikana is etched in Lonmin’s memory and “we’re doing everything we can” for the families, Sue Vey, a spokeswoman for the mining firm, said. The company would wait for the findings of an inquiry into the deaths and the subsequent recommendations, she said. A report on the Marikana killings was presented to President Jacob Zuma on March 31. The government is not obliged to publish its findings.